Cristina looks after the consumer market for all Pernod Ricard Travel Retail, brands, including all airport shops and cruise business, across Europe and extending through Russia and into parts of the Middle East and Iceland, as well as some smaller airports in South America. 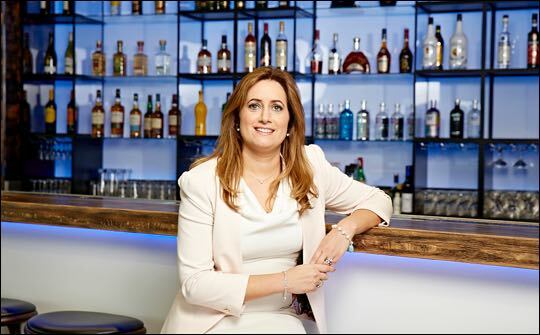 “I have been in this role for just four months,” she says, “and Pernod Ricard for close to ten years. I was working on Ballantine’s for nine and a half years, therefore I am very familiar with Pernod Ricard whiskies. I am now learning about the rest of the brands in the travel retail portfolio, which is really interesting. “My focus is very much on showcasing our products; it’s about engaging with the consumer and winning on the last three feet, so when they get to the airport, to the cruise, to wherever they are going to purchase, they encounter an experience. It’s about driving luxury and premiumisation. “There are some challenges for us at the moment… some of them out of our control, like currency, changes and conflicts, such as the Russian/Ukraine conflict… those things are really affecting us and it is very, very difficult to predict. In the last year, sales in Europe have suffered, although there are signs of recovery. Our year started on 1 July and our sales from the beginning of the year have been really good across all categories with no exception. “Travel retail as a channel is growing. It is hugely important for us. It is the second largest market for Pernod Ricard after Americas and we will invest a lot of money and resources in it. “Our leading brands are probably Absolut within vodka and Chivas within whisky – they are the two iconic brands for Pernod Ricard, and they are probably the biggest in terms of sales as well. Ballantine’s is big for us in Europe particularly, but it is also big in Asia. The single malt whisky category however is also growing and therefore we’re now putting time and money behind these products," she adds. I asked if there were any new product areas Pernod Ricard was considering. “We are," she confirms. "Innovation is key. It is one of the pillars in our strategy for this year, particularly in Europe, but also across the entire travel retail business. We are looking at how we can innovate in every category. We have 13 new products out of which I think three or four are exclusive to travel retail. We are also creating new categories, for example, for Ballantine’s we are bringing out a new Scotch whisky with a small link into American whisky, and with Absolut we are bringing out a range of craft products. We are also launching The Winemaker’s Art – wine has been a category without innovation for a while. We are also bringing huge innovation to Jameson whiskey – for the first time, Jameson is launching a travel retail exclusive, a new series and a more premium type of portfolio. So we are innovating, we are bringing new products and tapping into different consumer needs." "Limited editions are really important for us. They differentiate travel retail from domestic markets, but not only that, they allow us to offer consumers a product that is unique and exclusive to that place. "We do a lot of exclusives with our customers. For instance, we might have an exclusive with a retailer for, say, three months or six months to make it quite unique to that airport. Consumers are looking for unique experiences and unique products that they can buy only in one place. We have, for example, created special Martell 300th anniversary packs, and we are launching exclusive products every year with Chivas – this year we are linking with Globetrotter (the travel company) with a beautiful gift bag that very much links the product with travel. This is something that is really driving sales for us. That is, for example, exclusives and offers based on the packaging more than the product. This applies across everything that we do, but particularly in the super premium and prestige area. In this area we are having to step up quite a lot in terms of the quality of our packaging. If you look at the packaging for the Chivas Icon, for example, it is a step up from any whiskies we have done before. It is very impactful, which it must be, after all, the purchase is made on shelf within three/five seconds – so you have to catch the eye. "Absolut Electrik will be coming out over Christmas and this has beautiful packaging, a really striking, shiny electric blue bottle and a shiny silver bottle which look stunning on the shelves. With a brand like Absolut, consumers like to have the bottle as a collector's item and this is something we are finding particularly important for the travel retail. The packaging needs to really stand out and catch the eye as they walk through. “Sampling is also important although not for all our products. For example, in the case of Absolut, people already know Absolut Original, so it’s the packaging that creates the impact but, obviously, when you have something like Chivas Ultimate Cask Collection, the sampling is very important because it is a new thing, it’s a new product so people want to just taste it and see what it is. "However, it is really about engaging the consumers, either through the activation we create at point of purchase or through the way we talk about our products. This is particularly true with the amount and variety there is nowadays in duty-free. It can be a bit overwhelming for consumers.